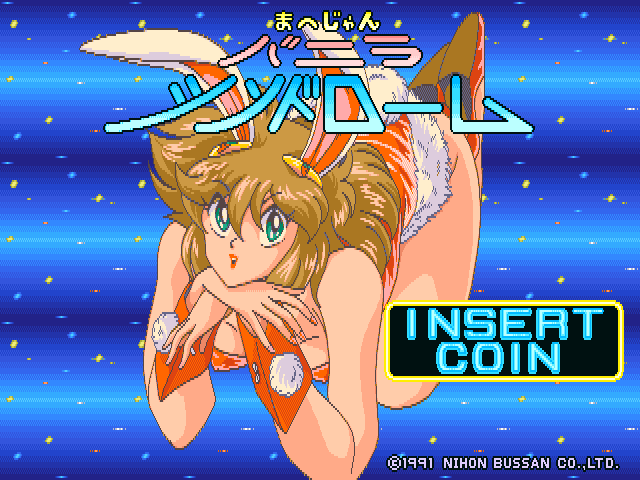 Welcome to my English language walkthrough of Vanilla Syndrome, one of Nichibutsu’s vs Mahjong titles. I picked this one for some special attention because it has great character design, excellent music and graphics, and a story based quest. Of course since it’s a quest not only is there a lot of trial and error required to progress, that’s even if you can speak Japanese to begin with. I can’t but I know a man who can. The fact that the main opponent is the best bunny girl ever, has nothing to do with it. At all. 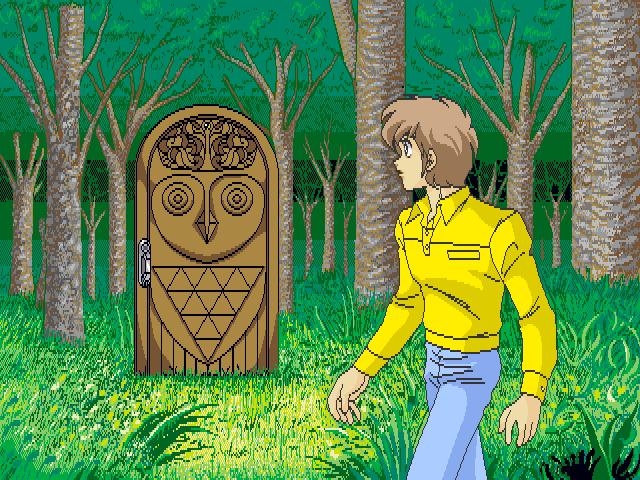 Our hapless hero Kousuke is out for a walk in the woods, when he finds a suspicious door (with the Nichibutsu owl on it). He unwisely opens it and falls into a dark void. When he wakes up, he comes face to face with bunny girl Vanilla. Oh, did you just wake up? Are you feeling okay…? Who are you…? And… where am I…? You opened the door to another dimension. I’m Vanilla, the guardian of that other dimension. Nice to meet you! Nice to meet you… Hey, wait a second! Send me back to my world! I have a date to go on! I’ll give you a chance if you take me on at mahjong…! When you’ve put in a credit a screen will appear allowing the player to continue using a code from a previous game, or start a new game. Start will begin a new game, use A-N to enter the code if you have one, use Riichi to move the cursor right, Kan to move left, Pon to delete the selected letter and Ron to enter the code. Pressing Ron with an invalid code is fun. If you beat me, I’ll let you choose one door key. Choose carefully and find the one that leads back to your world, okay? From here the game follows a sequence of item shop, Mahjong round, key selection, and back to item shop again. Instead of having to deplete Vanilla’s points as in other games, you simply have to beat a single hand. Should you lose a round you will lose points, but these are accumulated as you play. The more points your hand is worth, the more carrots you’ll receive – currency in the item shop. A – you get 10 seconds, select any tiles you want to replace before the timer runs out. B – after Riichi the game locks your hand, unlike some other games you can’t cancel it by taking a tile to improve your hand. Use this item by pressing Start to remove Riichi state if something good comes up. Once purchased you retain this item across hands and continues – it will show as unavailable in the shop if you have one stocked. C – simply displays the tiles Vanilla needs when she uses Riichi. D – at the start of the game Vanilla gets electrocuted and falls asleep, you have a short amount of time where you can take up to 10 tiles to improve your hand – for the price this one is great. E – next time you Riichi (carries across hands) it will be a special orange carrot, 99% chance of getting a hand finishing tile. Don’t waste this one if Vanilla is already in Riichi state and instead play for time. F – pick from one of four possible starting hands, not sure how useful this is given the cost. This is the main game window, Vanilla will encourage you and generally react to the flow of play, lots of good artwork here and the music each round alternates between a few tracks. Everything else should be fairly obvious here – it’s very standard rules and she will make fun of you if you end up in Furiten. As with most Nichibutsu Mahjong games, finishing hands quickly is usually more important than big points. If the game decides it’s time to crush you and hikes the rank up to max, no amount of points will help. I’ve seen 75k banked turned into zero with 3 losses. This is the key selection screen upon winning a round. At the start of the game red 1 & 8, green 3 & 8 and blue 8 are unavailable. This location notation is used for the entire walkthrough. You don’t really get much time to select the key, use M and N to navigate and Ron to select – it does wrap from red 1 to blue 8 though which can be useful. 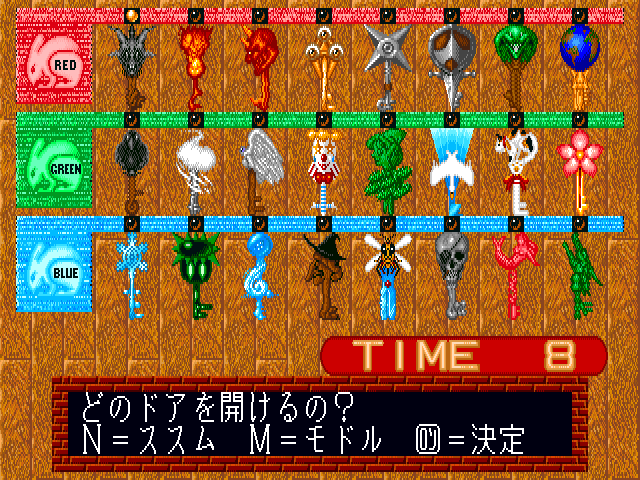 Behind each key is a character from this dimension who may give the player a quest or a clue. Hey, try one more time! Come on… No can do? If you lose all your points you’ll be encouraged to continue, but if you choose not to the game will give you a code for picking up where you left off later. Without this feature I suspect nobody would have the patience to beat the game. 50 or more carrots will turn into 50. Let’s meet again somewhere… See you later! Bye-bye! 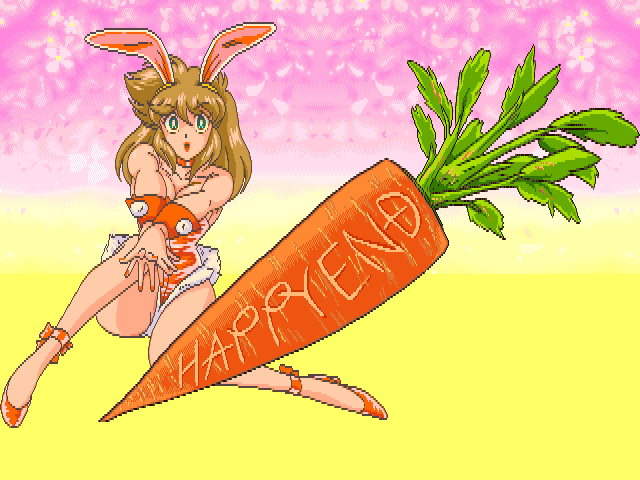 The message about 50 carrots I believe means that any carrots you have in excess of 50 will be discarded. You get quite a long time to record the code presumably so people can rush around an arcade trying to borrow a pen. Finally after all that, it’s time for the actual walkthrough! This is the most likely start location for most players. Burg of the Fire Sprites tells Kousuke that she will help in return for 3 crystals. This is the land of the Fire Sprites. I'm Burg, did you have business with me? I am Kousuke Moroboshi! I want to get back to my own world, do you know anything about that? Bring the three crystals back here... And I'll give you something good! Chao tells Kousuke to take her crystal and two others to the Fire Sprites. Welcome to Clown Land. I am Chao, the guardian of this place. And you are...? If you bring this crystal and the other two to the land of the Fire Sprites, you'll receive something. 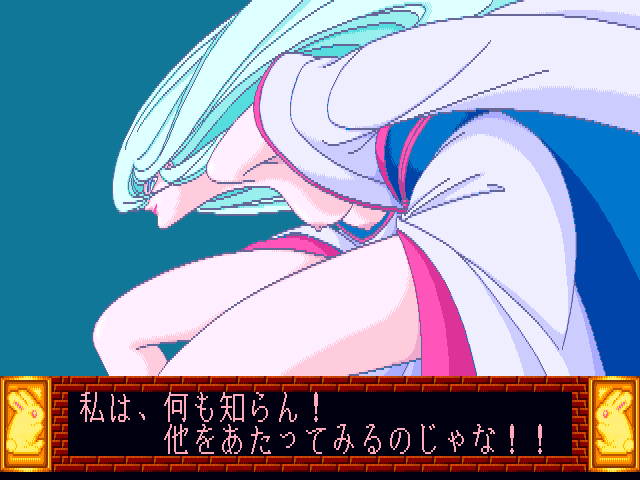 Rem tells Kousuke to take her crystal and two others to the Fire Sprites. This is the land of the Oni Clan, yo. I am Rem. What business do you have in our land? Okay, yo! Take this crystal and the two others to the land of the Fire Sprites! Nyala of Cat Land tells Kousuke to try Snake Land instead.. Welcome to Cat Land, my name is Nyala. Why have you come here!? Sorry, I don't really know anything. Someone in Snake Land might know, though. At Snake Land, Zarla tells Kousuke that the bee people have a crystal. This is Snake Land, and I am its guardian, Zarla. Do you have business with me? The Catgirl Nyala told me you might have some information for me...? 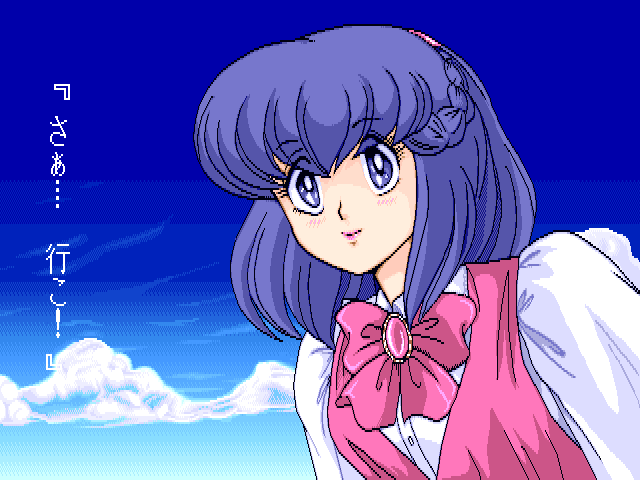 Only if Kousuke has talked to Nyala and Zarla, will Rumia hand over her crystal. Welcome to Bee Land. My name is Rumia. Why have you come here? Huh, you know Zarla... Well, in that case... Here you go! You're welcome! 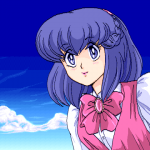 In return for giving Burg the three crystals, she presents Kousuke with the key to Devil Land (which is now added to the key rack), and tells him to visit the Wind Sprites first. If I give you these three crystals, you'll give me something really important in return, right? You've done well... And as for that thing I was going to give you, here it is!! This is the key to the Devil World... But before you go there, you should pay the Wind Sprites a visit! This is the first step of the Wind Sprites sequence. Runpa of Kappa Land tells Kousuke the Water Sprites could help, but they would want the Mermaids sword. Welcome to Kappa Land! I am the princess of this land, and my name is Runpa! Hmm, maybe the Water Sprites would happen to know something about that...? But they might want the Mermaids' Orichalcum Sword, so you'd better head to Mermaid Land first! Only if he has talked to Runpa in the previous step, Liza of Mermaid Land gives Kousuke the Orichalcum sword. Hi, welcome to Mermaid Land, I am Liza. You seem troubled, what's the matter? 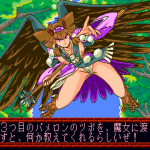 I was wondering if you could give me your Orichalcum Sword so I can go to the land of the Water Sprites? Oh... I see... Okay, here you go! This is the Orichalcum Sword you are looking for! Kousuke gives the Orichalcum to Lapras of the Water Sprites and she tells him to get the Wind Sprites key. Oh my?! This is the land of the Water Sprites! I am Lapras, and you are...? Runpa the Kappa told me that I should bring this sword to you. Oh! I've always wanted this! Go pick up the key from the Wind Sprites... See you! Earia will give Kousuke the key to Heaven if Lapras sent him here - and it will now appear in the key rack. The Devil and Heaven keys are the key progression items. This, is the land of the Wind Sprites. I am Earia, do you have business here? The Water Sprite Lapras told me that I could have the key you have. Please let me have that key! Oh! Did she say that? Well, here you go! Mi Mi will give Kousuke a clue to his quest if he fetches a pot from Pamelon. This story arc is optional. This is Witch Land, and I am Mi Mi! I am in the middle of training! Do you have business with me? This is Crow Land. I am Karula, the Crow Tengu. Do you want something? It's said that if you bring the pot of the three-eyed Pamelon to the Witch, she'll tell you something interesting! Pamelon will offer Kousuke a choice of 3 pots, but only if he has spoken to Karula and Mi Mi. There seems to be no clue about which to pick, but it's the most "pot shaped", option C.
Welcome to the land of the three-eyed clan. I am Pamelon, do you need something from me? I've been told that the witch will tell me something if I bring her the pot that you have. Could I have that pot, by any chance? Please! Sure. But, which pot do you want? Please choose any one you like! Choose any pot you want among these three. Push A-C. When he gives Mi Mi the pot, she will tell Kousuke that the Flower Sprites have the key he needs to escape. I've brought you the pot of three-eyed Pamelon! Now tell me what you know! Wow, lucky! This is just what I've always wanted! Rumor has it that Sherill of the Flower Sprites has key you need to return to your world. At Pirate Land, Captain Neros offers to help if Kousuke retrieves her treasure from the Ninjas. This is the second optional arc. Welcome to Pirate World, I am Captain Neros! What business do you have here? Hmm... Yeah, I might know something. If you take back our treasure from the Ninjas, I'll tell you! If Kousuke stumbles across Nei in Warrior Land she will give him an important clue - the ninja leader is called Gara. This dialogue only appears if he has spoken to Neros, but there are no clues to come here. This is Warrior Land, my name is Nei. What are you doing in a place like this? Well... I unfortunately can't help you... But you could ask a servant of the Ninja Gara. Hotaru the Kuniochi will hand over the stolen treasure if given answer 'C' for Gara. This is Ninja Land, and I am Hotaru the Kunoichi. What is your business here!? I would like to ask you to give back the treasure you took from the pirates. Ooh... You've got some nerve... Alright, but only if you can tell me the name of this generation's leader! Oh, you got it right?! Oh, whatever... Here you go! You return it! Take it! When Kousuke returns the treasure to Neros, she tells him that his way home is a red door. I've brought back your treasure! Now tell me what you know! Remember we had to talk to the wind sprites before using the devil key? Use the Heaven key they gave provided first, and Lana tells Kousuke to speak to Savana the devil for her Dragon World key. Welcome to Heaven. I am God's servant, the angel Lana. Do you have business with me? Oh, you should ask the Devil Savana for her key to the Dragon World! Since Kousuke has spoken to Lana first, Savana will hand over the Dragon World key, which now appears in the key rack. Welcome to Devil World. I am Savana. What the hell are you here for? I've come here because Lana the Angel told me to ask you for the key you've got. What?! Oh, I guess it can't be helped... since she found me out already... Here, take it and go! 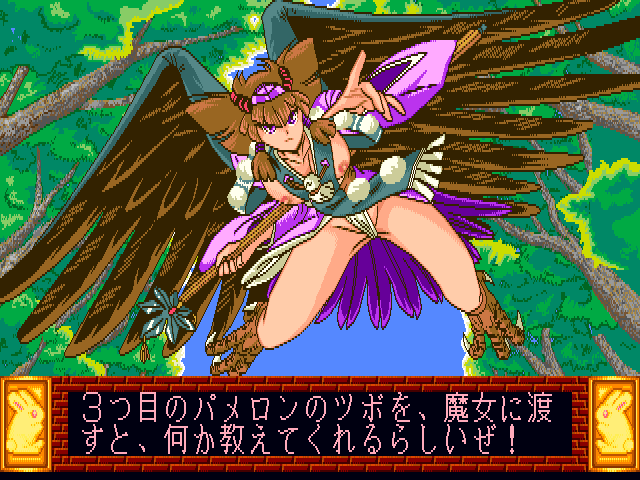 In Dragon World, Lauru gives Kousuke the key to the Flower Sprites, which now appears in the rack. This is our world, the Dragon World! I am Lauru, what is your business here? Take this key and go to the land of the Flower Sprites! You're really close to getting back to your own world now! Finally, Sherill of the Flower Sprites gives Kousuke the World key, which appears as the 8th red key in the rack. Welcome to the land of the Flower Sprites! I am Sherill. Did you have business with me...? Oh, that's quite an undertaking... Take this key, it will surely be of help. With this, you should be able to get back home to your own world. "Hey, what's wrong? I said let's go on a date today!" There are some keys which simply aren’t used by the story, I tried them at various points through the game to see if there was some flagged dialogue, but couldn’t find anything at all for them. I am Yuri, the Ice Girl! What business do you have in the realm of Ice?! No, I don’t know anything! Go try your luck somewhere else! This is the land of the Elf Clan. I am Lu the Elf, can I help you? No idea… I don’t really know much of anything. Sorry I couldn’t be of help! Welcome to Swan Land. I am Afros, do you have business with me? Nope, I don’t really know anything about that! Sorry! Thanks to Bnu for the translation of the many screenshots I sent him, and this guide would have taken a lot longer without the original Japanese walkthrough. Please note that it has redundant steps from a completion point of view and is slightly unclear (incorrect) in a few places – but it got the job done to begin with.